Like the country’s far right, HRW wanted to send human-rights violators to prison more than it wanted to end the war. On Sunday, Colombian voters rejected the peace agreement that the government, led by President Juan Manuel Santos, worked out with the FARC guerrillas by the slenderest margin possible: 50.21 percent to 49.78, a difference of 53,894 votes. The turnout was 37 percent, out of 34 million eligible voters. It’s a heartbreaking disaster for the long, intricate peace process, which sought to put an end to Colombia’s more than five-decade-long civil war. That war has claimed hundreds and hundreds of thousands of lives and has displaced millions upon millions of people. The peace deal, which was worked out during years of negotiations, mostly in Havana, was more aspirational than binding, offering hope that one of the world’s longest-running conflicts would come to an end. Now, that deal is in “tatters.” But keep in mind that “no” won with a sliver of a voting majority (less than 1 percent) of a minority (of eligible voters), with turnout low due to, in many precincts, extreme tropical rain, mostly in coastal departments where “yes” won handily. According to The New York Times, the government and FARC have already announced that they would send diplomats to Havana to begin discussing how to salvage the peace. The FARC responded to the vote by announcing that they remained committed to peace; indeed, the UN has already started disarming the guerrillas. Santos stated that the cease-fire will hold, and the historian Robert Karl, who just wrote a terrific “centuries long history behind Colombia’s peace agreement with the FARC” in The Washington Post, tells me that Santos, as president, has “a good deal of discretionary power” over the military, so let’s hope Santos can keep the security forces on a leash. What Washington, who has spent billions on this war (for the lethal effects of Plan Colombia, see these very useful charts by the Latin American Working Group), will do is unclear. As of early morning Monday, the State Department hasn’t commented. 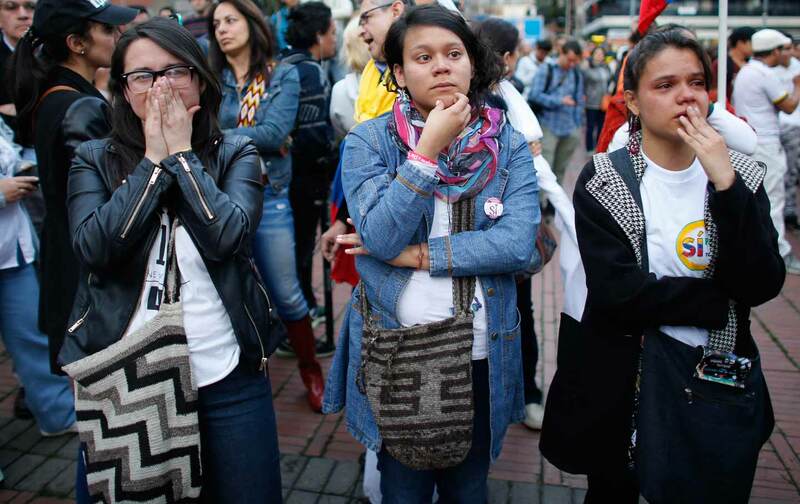 “No” won because the right wing, led by former President Álvaro Uribe, was able to turn a vote that was supposed to be on peace into a vote on the FARC. The geographic breakdown of the referendum indicates that “no” won in areas where Uribe and his political party have their support. Take a look especially at the department of Antioquia, where Uribe got his political start as a champion of paramilitary death squads. Sixty-two percent of Antioquia’s voters cast “no.” In the department’s capital, Medellín, a city that has been sold in the United States as a neoliberal success story—Modern! Urbane! Fun! Come visit!—63 percent of voters said “no” (for Medellín’s neoliberal “makeover,” see this essay by Forrest Hylton). Uribe served as president from 2002 to 2010. He is best thought of as a Colombian Andrew Jackson, riding to the top office of his country on the wings of mass murder, rural ressentiment, and financial speculation. As an ex-president, he has been toxic, doing everything he could to keep the war going. The Colombian elite, especially the retrograde sector Uribe represents, has much to lose with peace: The end of fighting would create a space in which the country’s many social conflicts—having to do with land, labor, and resource extraction—could be dealt with on their own terms, rather than distorted through counterinsurgent politics. And peace would be costly for some sectors, especially for all those Colombians in the “security” business who for years have fed off the Plan Colombia trough. The campaign to keep Colombia’s war going had an unlikely ally: Human Rights Watch. José Miguel Vivanco, the head of HRW’s Americas Watch division, emerged as an unexpected player in Colombian politics when he came out strongly against the “justice” provisions of the peace agreement. Vivanco agreed with Uribe by offering the most dire reading of the agreement possible, saying that perpetrators—in the FARC and the military—of human-rights violations would receive immunity. Vivanco was all over the press in Colombia, with his comments used to build opposition to the accords. Once it became clear that he was lining up too closely with Uribe, he staged a mock public dispute with the former para-president, even while continuing to basically support Uribe’s position (h/t Alejandro Velasco). Vivanco has tried to fudge his position with a false “even-handedness,” complaining that the accord let both the FARC and the military off the hook. But as the always insightful and usually temperate Adam Isacson, from the Washington Office on Latin America, described Vivanco’s bizarre proxy campaign on behalf of Uribe: “not everyone in Colombia is reading Human Rights Watch’s detailed ten-page analysis. What they hear are the large quotes like ‘piñata de impunidad’…or “checkmate against justice’ and believing as a result that Human Rights Watch opposes the entire process. It is a question more of tone, of supportiveness, and of urging creativity at a very key moment.” “Blows like this”—that is, Vivanco’s extremely dire analysis of a necessarily vague political agreement—“can do real damage.” They did. Now what, Ken? What are you going to tweet at these victims of the FARC who came together to urge a “yes” vote? According to the Colombian weekly Semana, those regions that suffered the most deaths at the hands of the FARC were the most supportive of the peace talks. A “paradox,” Semana said. Enough was enough, victims and their families said. They are painfully aware—in ways that Roth and Vivanco, with their unaccountable Twitter broadsides against the peace process apparently aren’t—of consequences. And they prove more capable of understanding something that the leaders of Human Rights Watch can’t: that you don’t end a half-century war, with its nearly incomprehensible political history and ever-shifting alliances, by applying legal absolutes. You rather end it by political compromise.